Rose Cottage in Wooley, near Hexham sleeps 5 people. This detached, cedar-built country holiday retreat is spacious and attractively furnished. 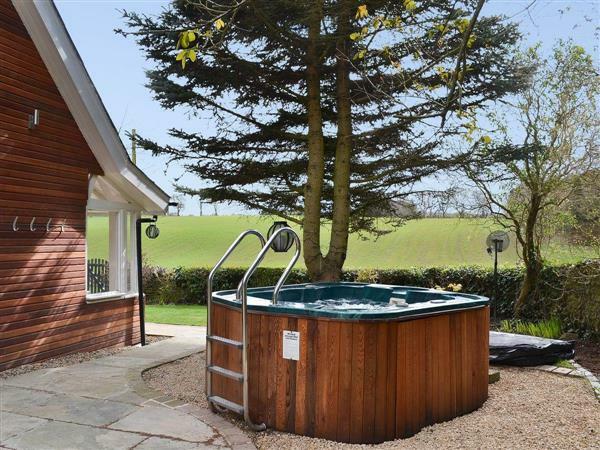 Set in a peaceful location, with stunning views, the large garden with its hot tub is a lovely feature. Situated between the abbey town of Hexham and historic Corbridge (both 3 miles). There are historic sites and tourist attractions in the area, including Hadrian’s Wall and Beamish, golf courses (Slaley Hall 2 miles), fishing, cycling, walking and horse riding. The Northumberland Coast, Newcastle, Durham, the Lake District and Scottish Borders are all an easy drive. Shop and pub 1 mile. Entrance porch, cloakroom. Living room with wood-burning stove and patio door. Spacious kitchen/dining room. Large wet room with bath and toilet. Separate toilet. First floor: Double bedroom with 5ft bed and wash basin. Double bedroom with additional single bed (for +1). For a better idea of where Rose Cottage is, you can see Rose Cottage on the map below. Rose Cottage is in Northumberland; should you be on the lookout for a special offer, you can find all the special offers in Northumberland. It's always worth checking to see what is on offer at the moment. Do you want to holiday near Rose Cottage (MVQ), you can see other cottages within 25 miles of Rose Cottage; have a look to find your perfect holiday location.